Trusting my own instincts to produce expressive art is a constant struggle. I strive toward a rhythm and freshness, feeling the composition and the emotion of the color as I proceed with the power of the field stitching uniting into focus. Sandy Altenberg earned a BFA in Studio Art with an emphasis in Printmaking, Painting and Fiber Arts. Sandy has just been juried into Quilt National 2017. 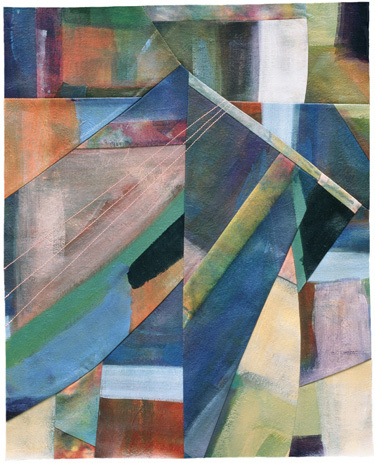 As well, she was not only juried into Quilt National very early in her career as a quilt artist, but her piece was also chosen as the cover art for the Quilt National 1999 catalogue. Currently, she is interested in the study of the expressive potential of line contours and their related shapes. Sandy's practice has involved painting and dyeing fabric and then covering it with elaborate machine chain stitching and hand embroidered threads which she has hand dyed.